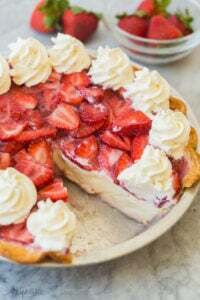 This Strawberry Cream Cheese Pie recipe has a homemade pie crust, creamy filling and fresh strawberry topping but is surprisingly easy to make! It’s the perfect Spring dessert! Includes step by step video. I feel like by admitting this you can tell I’m getting older (and more responsible, right?!). But I just don’t love frosting like I used to. I used to love making cakes, and cupcakes and extravagant, over-the-top, crazy, unbelievable desserts but I just don’t anymore. Give me a cookie or a fruit dessert, and I am so there. Simple to make, it doesn’t take me 2 hours to decorate and I’m not left eating it for the next 18 days. If you knew me a few years ago, you would think this was a little bizarre. I used to love cake. I loved frosting. I loved sugar (okay, I still do). But I’m finding I just can’t handle it like I used to, so the lighter and fruitier the dessert, the more I enjoy it. I don’t make a lot of pie, so if I’m going to make a pie it has to be the right one! Apple pie, and honestly most fruit pies, they don’t really tempt me. So much pastry, so little filling. But a cream pie? Chocolate, banana, coconut, caramel or this Strawberry Cream Cheese Pie? They are converting this former cake-lover one slice at a time. Start with the pastry: you can use either this homemade pie crust recipe or a refrigerate pie crust from the grocery store. I won’t judge either way! I do both, depending on how much time (and energy!) I have. Make the cream cheese filling: just a few ingredients and an electric mixer are all you need! Feel free to use light or regular cream cheese here (no one will notice a difference! In fact, I usually use light). 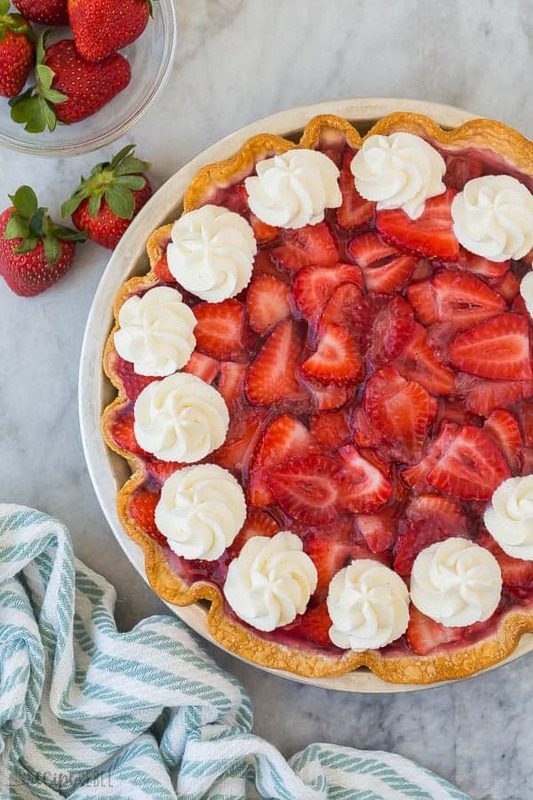 *NOTE: large sliced strawberries do make this pie a bit more of a challenge to slice though they are beautiful. If you want to chop the strawberries into smaller pieces, it will be slightly easier to slice. 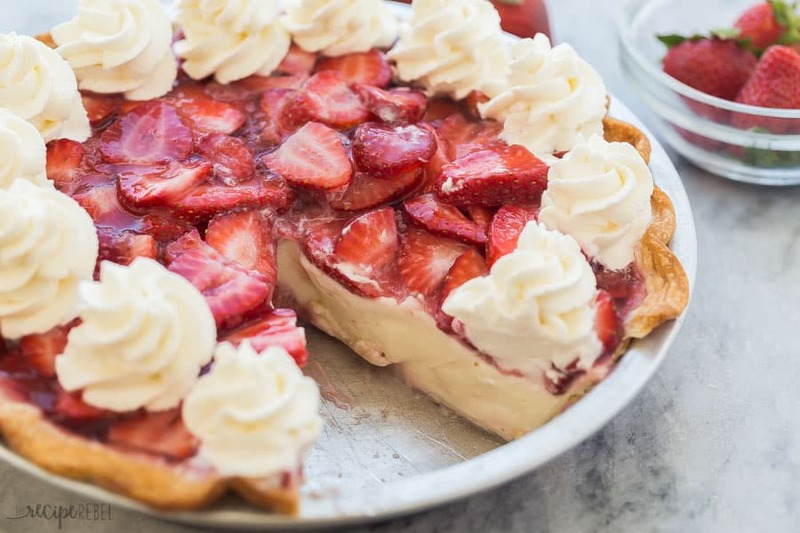 Can I use frozen strawberries to make this Strawberry Cream Cheese Pie? You can use frozen strawberries, but you will need to thaw them in advance and account for the extra liquid. To do this, strain the juice from the thawed strawberries and measure, then use this as part of the juice needed to set the gelatin. Can I make this strawberry pie ahead? This pie is easily made ahead and refrigerated! It can be stored in the refrigerator for 2-3 days (though I recommend serving within 24 hours for the freshest berries and firmest pastry! The crust will soften the longer it sits). This pie cannot be stored at room temperature but can be left out for an hour or two while serving. Can I freeze this Strawberry Cream Cheese Pie? Unfortunately, this is one pie that cannot be frozen. The pie crust and cream cheese mixture will freeze fine, but the gelatin topping cannot be frozen. 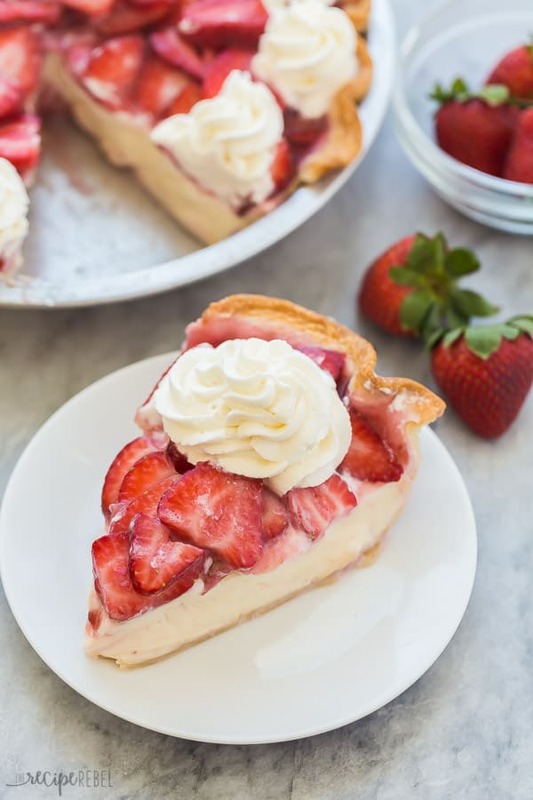 This Strawberry Cream Cheese Pie recipe has a homemade pie crust, creamy filling and fresh strawberry topping but is surprisingly easy to make! It's the perfect Spring dessert! Includes step by step video. Preheat oven to 425 degrees and press pie crust into a 9" pie plate. Crimp the edges as desired. Bake for 8-10 minutes until the edges are light golden brown. Remove the parchment and pie weights and continue baking another 4-5 minutes until the bottom is light golden brown. Set on a wire rack to cool to room temperature. Add the vanilla and powdered sugar and beat on low speed until smooth. Add the cream and beat on low until incorporated, then beat on high speed until thick and fluffy. Set aside. Place 1/2 cup cold juice in a medium bowl. Sprinkle entire package of gelatin over the top and set aside. Whisk together the remaining juice and jam. Heat in the microwave on high for 45 to 90 seconds, until very hot but not boiling. Whisk into the gelatin until dissolved and set aside for 15-20 minutes until it reaches room temperature (you can use the fridge to speed things up if you need). Spread cream cheese filling into cooled pie crust. Top with strawberries, then carefully pour the cooled gelatin mixture over the strawberries to fill the crust (if you don't use it all, it's okay!). Refrigerate for 4-6 hours until completely set. Top with whipped cream if desired and serve. *You can use any red juice to make the gelatin, or simply use water. If using water, you may want to add a tablespoon or two of sugar if your strawberries are not too sweet. **If you need to keep things simple, you can use a package of strawberry Jello instead of the homemade gelatin layer. Simply reduce the amount of water called for on the package by 1/2 cup. You can cook the strawberries on the stove and add some dissolved corn starch to thicken, then pour over the cream cheese layer to firm up. It won’t be quite as firm but will still be delicious!